Should Millennials Ever Grow Up? The false distinction of generational compromise. But consider the lives of their counterparts, the Grown-ups. Those Grown-ups have family responsibilities, budgets to balance, back deck extensions to order, beach-houses to rent, and other pressing problems. Millennials, at least in theory, have mostly vague, existential complaints that can be ignored indefinitely: retirement and social justice issues will be hashed out one day, but probably not today and definitely not by the Grown-ups in charge, who have more immediate, “real-world” problems: private school tuition, soccer practice, and the morning commute. Is it possible, how is it possible, to have more meaning and honor in work? to put wealth to some real use? to have a high standard of living of whose quality we are not ashamed? to get social justice for those who have been shamefully left out? to have a use of leisure that is not a dismaying waste of a hundred million adults? Despite admirable gains in areas such as civil rights and gender equality, Goodman’s concerns were never fully addressed during his lifetime (he died in 1972), and remain unresolved today. Then, as now, the ball was in the Grown-ups’ court — but they were too overwhelmed with trivial tasks to accomplish everything they needed to do. The Grown-ups rush to compromise because they are always rushing, hurrying here and there. Their perpetual motion on the hamster wheel is something we will “understand when we’re older,” and embracing cynical indifference appears to be the crucial dividing line between feckless Millennial and reasonable Grown-up. Other features that might evince maturity, such as having children or owning a house, appear incidental to becoming a Grown-up; what matters most of all is arriving at the conclusion that there are no alternatives to the status quo. I’d be lying if I claimed I didn’t occasionally fantasize about being a Grown-up. How nice it would be, I daydream, to fret over my cratering mutual funds and a sunroom extension I can’t afford and attending to my cholesterol levels! It doesn’t matter that all of these worries are tedious to the point of exhaustion: a Grown-up is always out of breath from running in place, and so never able to talk with friends (who has the time?) about widening income inequality and looming ecological devastation. Like them or not, these petty Grown-up annoyances would indicate I had progressed from one stage of life to another. I would have matured, become a person of substance, and could begin desperately trying to stockpile assets while awaiting the peace of the grave. Up to this point, I have passed through most of the life cycle that defines 20th century America: childhood — a “priceless” period in which I was allowed to imagine things while consuming cheap plastic toys — adolescence — when I listened to angsty music and assumed I could change the world — and then…full stop. I stalled at Millennial, always a few minutes late to my appointment with the other Grown-ups. And the restless, searching era of the automobile-supplied teen of the late 1950s, the period critiqued so sharply by Paul Goodman in Growing Up Absurd, was another social construct. Middle-class teens, who were really just adults not yet ready for the workplace, found themselves with a little cash in their pockets, some gas in the tank, and nowhere to go, both literally and figuratively. Teens were allowed to “discover themselves” before accepting their fates as Grown-ups, a process that has increased in duration following a late-1980s boom in graduate and professional-school attendance and a corresponding rapid decline in the number of entry-level white-collar jobs available to college graduates. All of this culminates in the caricatured “woke Millennial” of 2016: a lost soul studying intersectional texts and supporting doomed candidates and utopian reforms, their receding years drawing them ever closer to the void even as some of their savvier peers opt out, join the system, and become full-fledged Grown-ups (as happened to every prior and seemingly pure youth movement, from Beats to Gen X’ers, that grew old). It’s a shabby state of affairs, one in need of radical change. In Growing Up Absurd, Paul Goodman gets the diagnosis right, but his proposed cure doesn’t go far enough. 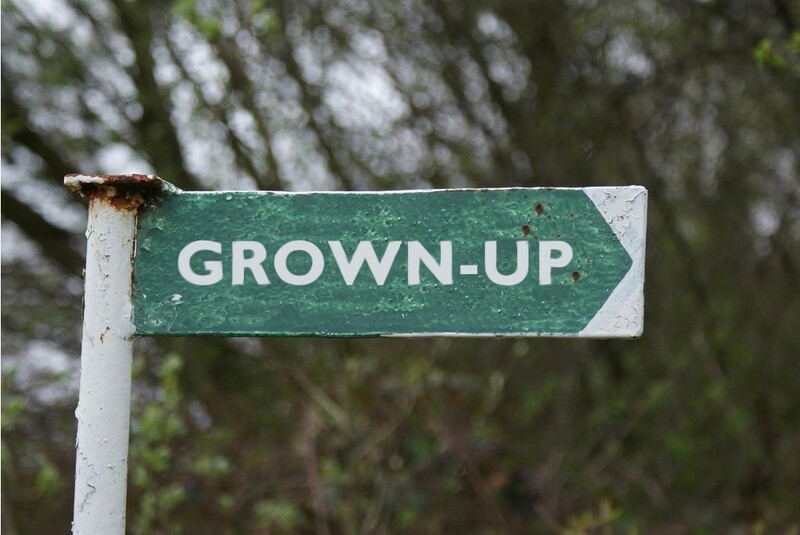 We shouldn’t ever want to become Grown-ups. None of us should want their lives, because their lives are merely lengthy, chore-filled preludes to the nursing home and the cemetery: an endless string of pointless tasks that preclude them from ever addressing important ones. Instead, we should work to rid ourselves of thinking in terms of categories like “child,” “tween,” “teen,” and so forth. Age is only a number, not some all-important advertising metric that determines whether we want to rent UFC pay-per-views or use Cialis, and it should be treated as such. One of the positive developments of the past decade is the growing recognition that identity ought to be affirmatively chosen, never imposed from above. And though these labels for life stages might fit like an old shoe — they’re the way they are because that’s how they always were — that doesn’t mean we need to follow them. Even as individuality is paramount, collective responsibilities shouldn’t be sloughed off because you’re late for some school play or a bridge closing has added thirty minutes to your commute. Labels have a tendency to take on lives of their own, and a refusal to accept being branded as old, out of touch, and needlessly, endlessly “busy” may well preclude people from embracing such a slide into that sad second act of their existences. Prior generations have faced the same choices, and some courageous-minded folks have held the line: tired beats, worn-out civil rights crusaders, old hippies, aging gay liberation activists, flannel-clad scene kids from the 1990s who refused to “sell out.” But being forced to choose between working to solve chronic social problems and merely hanging around is no choice at all, and we ought to leave such decisions in the dust.